Killer Characters: What Can Go Wrong at Mrs. Hudson's Tea Room? What Can Go Wrong at Mrs. Hudson's Tea Room? I love my job! And one of the things I like best about it is when I can use my skills to help others. Case in point: Tomorrow we’re putting on a cream tea to help Scarlet House, the West London museum, raise funds for its rebuilding effort after the fire. They’re having a silent auction and all the local businesses have contributed something. Hosting the event is the perfect contribution from me. I’m Jayne Wilson, the head baker and part-owner of Mrs. Hudson’s Tea Room located at 220 Baker Street, West London, Massachusetts. We’re next door to the Sherlock Holmes Bookshop, owned by my best friend Gemma Doyle. Gemma, on the other hand, isn’t so fond of putting on charity events. Not that she doesn’t believe in giving back or in helping out, but Gemma’s not so keen on working in the kitchen. Any kitchen – including her own. (see http://www.killercharacters.com/2018/08/not-another-charity-tea.html ) So this time I won’t ask her to prepare the food or even serve tea. I’ll put her on the door, collecting tickets. She can’t get into much trouble doing that. 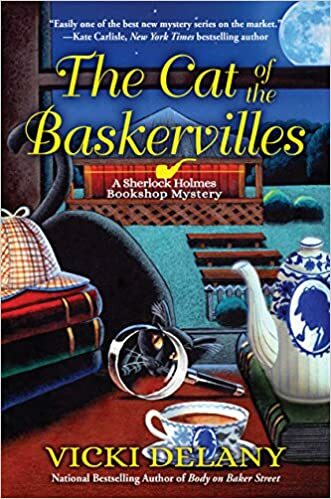 It won’t be like the full afternoon tea we did for the West London Theater Festival which ended in murder, as recounted in The Cat of the Baskervilles. 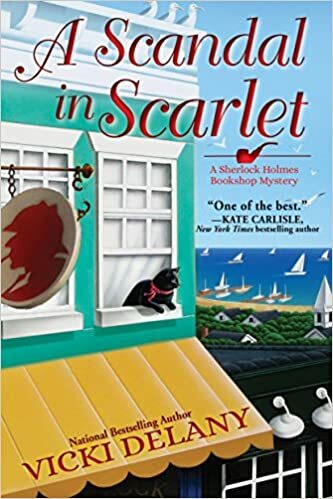 Find out if the charity tea goes smoothly in A Scandal in Scarlet, the fourth in the Sherlock Holmes Bookshop series by Vicki Delany. The book will be released November 13 by Crooked Lane Books and is now available for pre-order. For more information on Vicki and her books, go to www.vickidelany.com. She regularly runs contests and giveaways on her Facebook page www.facebook.com/evagatesauthor. To sign up for her newsletter or to request a free bookmark or signed bookplate, drop her an email. I really like this series! Hope this tea turns out better than the last one! You'll have to wait and see, Deb!